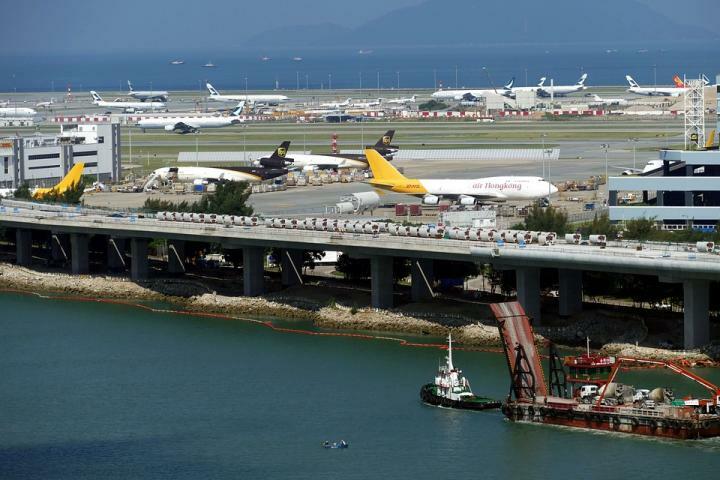 With more than 1000 flights per day, Hong Kong International Airport (HKIA) is one of the busiest airports in the world. Hence, the occurrence of low-level turbulence around HKIA, which can influence the landing and departure of aircraft and is closely related to aviation safety, is an important topic of study. In a collaborative effort between the School of Energy and Environment at the City University of Hong Kong and the Hong Kong Observatory, the influence of large-scale circulation on the occurrence of low-level turbulence at HKIA was investigated. By utilizing the Doppler Light Detection and Range (LIDAR) system at HKIA and radiosonde data at King's Park Meteorological Station, it was found that the possibility of turbulence occurrence is related to the strength of southerly winds. Since the southerly wind passes through the high and complex terrain of Lantau Island to the south of HKIA, it can generate terrain-induced turbulence. Based on reanalysis data from the European Centre for Medium-Range Forecasts, the local wind direction during turbulence occurrence was found to be consistent with the wind direction over the southern China coast. This suggested that large-scale circulation may play a role in controlling the occurrence of low-level turbulence at HKIA. The variation in local southerly wind was attributed to atmospheric systems on different timescales, including the passage of temperate cyclones, the westward extension of the western North Pacific subtropical high, and the seasonal cycle of low-level geopotential height. Moreover, their contributions to the variation in southerly wind were found to be competitive. Plus, the seasonal-cycle change in geopotential height was found to lead to meridional wind change on the seasonal timescale, resulting in the frequency of low-level turbulence occurrence peaking in autumn. In summary, the study demonstrates a link between large-scale circulation and turbulence occurrence at HKIA. To elucidate the variation in southerly wind over Hong Kong and the occurrence of turbulence at HKIA, atmospheric systems operating at different timescales should be considered.